This is an interesting biography of Jane Franklin Mecom, who was Benjamin Franklin's sister. Everyone knows Mr. Benjamin as one of the Founding Fathers of the United States, but his sister Jane was almost lost to history. Benny and Jenny, as they were nicknamed as children, were kindred spirits and exchanged many frank and personal letters during their lifetime. "The two eyes of man do not more resemble, nor are capable of being upon better terms with each other, than my sister and myself," Benjamin once wrote. Jane was born in 1712, when Benjamin was 6 years old. It was Benjamin who taught Jane how to write, which was a rare skill for women. From the viewpoint of the 21st century, it is still disturbing to learn how little of an education girls were given back then. No public school in Boston enrolled girls. "Everyone needed to learn to read, but there was no need for a girl to learn to write ... At home and at school, when boys were taught to write, girls learned to stitch. Boys held quills; girls held needles." In addition to writing, Benjamin also urged his sister to read, and often sent her books from his travels. She had little free time while doing chores and raising her children, but she was eager to read whenever she could. She confided to her brother: "I read as much as I dare." Sadly, most of Jane's letters appear to have been lost to time. We know they existed because Benjamin references them in his own letters, more of which have survived. 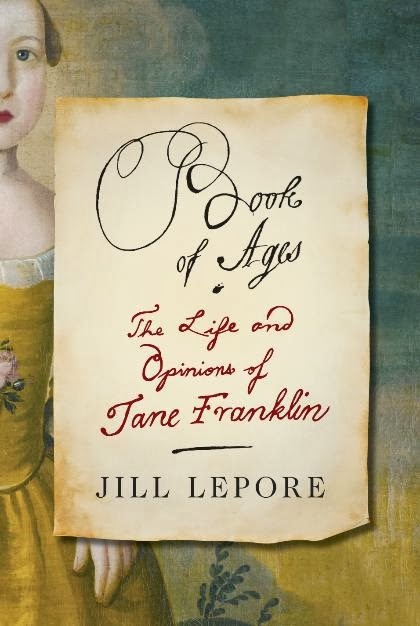 Lepore pieces together Jane Franklin's life from other documents, including newspapers, Benjamin's letters, and also a small book that Jane herself wrote, which she titled Book of Ages. It was a chronicle of births and deaths in her family, including her 12 children. Lepore quietly and repeatedly points out that Jane was smart and shrewd, and perhaps if she had been given more of an education or if women's roles weren't so restricted, she might have played an important role in society and politics, similar to her brother. It's always fun to play the "What If" game with history, and in this case, I think it might be true. In the Appendix about her research methods, Lepore admits how frustrating it was to try to learn more about Jane when so little of her writing has survived. "For a long time, I was so discouraged that I abandoned the project altogether. I thought about writing a novel instead. But I decided, in the end, to write a biography, a book meant not only as a life of Jane Franklin Mecom but, more, as a meditation on silence in the archives. I wanted to write a history from the Reformation through the American Revolution by telling the story of a single life, using this most ordinary of lives to offer a history of history and to explain how history is written: from what remains of the lives of the great, the bad, and, not as often, the good." The book is a bit slow at the beginning, but I did enjoy reading about life in colonial America and the challenges Jane faced, especially during the War of Independence. Jane and her family fled for their lives on several occasions, which made it even more difficult to track down relatives later. It was also fun to see the different spellings of early English. Lepore noted that the idea of "correct" spelling didn't come until there were rules for printers. "People used to spell however they pleased, even spelling their own names differently from one day to the next ... But only the learned, only the lettered, knew how to spell." The book also has good details about Ben Franklin's career, but not so much that it overwhelms the narrative about Jane. I would recommend it to fans of history, especially to those who want to know more about the lives of women in early America. As Ben Franklin once wrote in Poor Richard's Almanack, "One half of the world does not know how the other half lives."